A half-plate ambrotype from the Guy DeMasi collection pictures Surg. William Swann of the 6th Georgia Infantry. 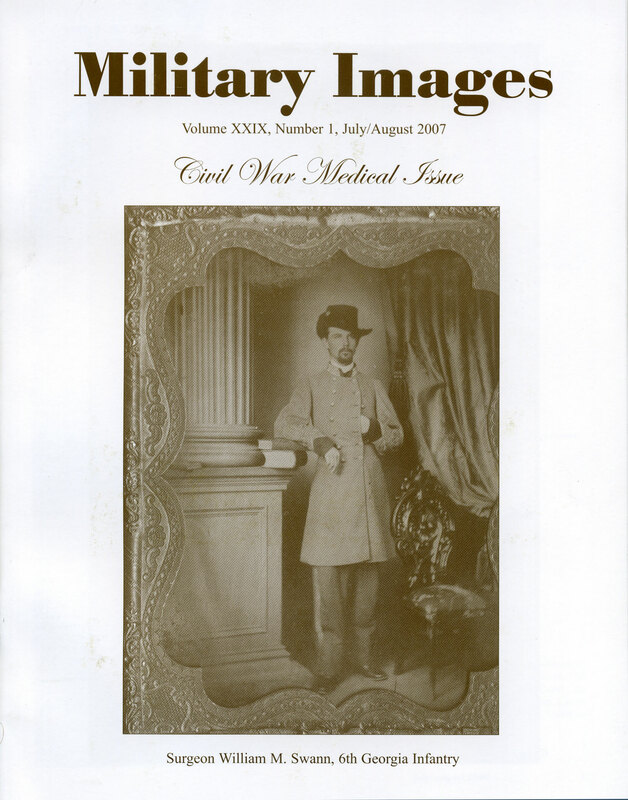 The editor thanks several key individuals who contributed to this special issue of medical-related images, and promotes Portraits in Gray: A Civil War Photography Exhibition featuring the images of MI Contributing Editor David W. Vaughan. Subtitled “A Leading Collector Reminisces About Collecting Medical Images,” the author explains how photographs were originally not big on his list to acquire and how that changed when he became interested in these “capsules of history.” He continues to discuss some of the most memorable images in his collection. What follows Dammann’s introduction is 116 photographs gleaned from the author’s collection and others. The images are grouped in the following categories: Surgeons (47 images), hospital stewards (14 images), medical facilities (10 images), women medical workers (8 images) and war casualties (37 images). Many of the portraits are identified. The surgeons include Corp. Erastus Worthen of the 2nd Vermont Infantry, Dr. Edward Revere of the 20th Massachusetts Infantry, Maj. E. Burke Haywood, acting medical director of the Confederate Department of North Carolina, Surg. George Osborne of the 5th Massachusetts Cavalry, Surg. John Wesley Hunt of the 10th New York Infantry, Asst. Surg. John Morris of the 150th Pennsylvania Infantry, Surg. David Dixon of an unknown Union regiment, Surg. Emil Gulich of the 9th Illinois Infantry, Surg. James L. Dunn of the 109th Pennsylvania Infantry, Clara Barton, founder of the American Red Cross, Surg. William Randolph of the 17th Kentucky Cavalry (U.S.), Surg. David Leroy of the 91st Illinois Infantry, Surg. Henry F. Lyster of the 2nd and 5th Michigan infantries, Surg. Abraham Crispell of the 20th New York State Militia, Surg. Edwin Bentley of the 1st Connecticut Heavy Artillery, Surg. Charles Bower of the 6th Pennsylvania Reserves, Asst. Surg. Myron Underwood of the 12th Iowa Infantry, Medical Director of the Army of the Potomac Jonathan Letterman, Medical Purveyor of New York Maj. Richard Smith Satterlee, Asst. Surg. Richard Powell of the 88th New York Infantry, Surg. Samuel R. Wooster of the 1st Michigan Cavalry, Surg. Robert Hubbard of the 17th Connecticut Infantry, Surg. Ferdinand Hayden, Chief Medical Officer of the Army of the Shenandoah, Surgeon and Medal of Honor recipient Gabriel Grant of the 2nd New Jersey Infantry, Surg. Robert Smith of the 11th Pennsylvania Infantry, Naval Surg. John J. Gibson of the Seminole, Asst. Surg. George Perkins of the 22nd Massachusetts Infantry, A group portrait of field and staff officers of the 22nd Massachusetts Infantry including Asst. Surg. George Perkins, Adj. Frederick Benson, Lt. Col. Thomas Sherwin, Quartermaster Harrison Royce, Surg. Isaac Stearns, Chap. Charles Tyler, Col. William Tilton and Maj. Mason Burt, Surg. James A. Armstrong of the 73rd and 75th Pennsylvania infantries, Asst. Surg. Prior N. Norton of the 20th Kentucky Infantry, Surg. Horace Potter of the 105th Illinois Infantry, Surg. James S. O’Donnell of Purnell’s Legion Maryland Infantry (U.S.), Surg. Stephen F. Elliott of the 4th Battalion California Mountaineers, Surg. Matthew F. Price of the 1st Pennsylvania Light Artillery, Surg. Fidelio Gillette of the 9th New Jersey Infantry, Asst. Surg. Henry C. Barrell of the 27th and 38th Illinois infantries, Surg. Thomas M. Flandrau of the 146th New York Infantry, Asst. Surg. Edward C. Franklin of the 2nd Rhode Island Infantry, Surg. Francis Pillichody of the 74th Pennsylvania Infantry, Surg. Horace Gates of the 31st Iowa Infantry, and Surg. Walter Burnham of the 6th Massachusetts Infantry. Identified hospital stewards include Elisha Post of the 66th Ohio Infantry, David Knowles of the 1st Connecticut Cavalry, Charles L. Barnes of the 15th Connecticut Infantry, Amasa D. Ward of the 38th Massachusetts Infantry, Arthur W. Cox of the 19th Massachusetts Infantry, Lewis Sager of an unidentified regiment, Arand (Aaron) VanderVeen of the 8th Michigan Infantry, Algernon Marble Squier of the 9th Vermont Infantry, Frank P. Davis of an unidentified regiment, William Henry Harrison Prime of the 23rd Massachusetts Infantry, Peter Paul Fuchs of the 99th Pennsylvania Infantry and Lorenzo Higgins of the 67th U.S. Colored Infantry. Identified medical facilities include the hospital at Fort Columbus in New York Harbor, Union Brigade Hospital at Dalton, Ga., U.S. General Hospital No. 4 in Nashville, Tenn., Barracks at Baton Rouge, La., medical staff of Lincoln U.S. Military Hospital in Washington, D.C., Officer’s U.S. Military Hospital in Memphis, Tenn., Adams U.S. Military Hospital in Memphis, Tenn., U.S. General Hospital #3, “Klein House,” at Vicksburg, Miss., “Harvey Hospital” or U.S. General Hospital in Madison, Wis. and a federal hospital in Beaufort, S.C. Identified women medical workers include Medal of Honor recipient Dr. Mary Walker and Mary Ashton Livermore of the U.S. Sanitary Commission. Identified war casualties include John W. Shelow of the 110th Pennsylvania Infantry, Jacob Johnson of the 12th Louisiana Infantry, Frederick A. Bartleson of the 100th Illinois Infantry, Capt. Albert Gallatin Lawrence of the staff of Gen. Adelbert Ames, Levi Hutchens of the 1st Confederate Infantry, Roger Bellis of the 1st Potomac Home Brigade Maryland Infantry (U.S.), Dennis Mehan of the 2nd Massachusetts Infantry, Capt. Isaac Shelby of the 28th Mississippi Cavalry, Robert Avery of the 102nd New York Infantry, a companion image of Avery with Joseph Goodman of the 147th Pennsylvania Infantry and Charles T. Greene of the 12th Corps, Alfred C. Lindsey of the 136th Pennsylvania Infantry, James W. Jackson of the 22nd Michigan Infantry, Samuel Affolter of the 176th New York Infantry, Patrick Henry Lennon of the 42nd New York Infantry, Daniel Alton of the 27th Indiana Infantry, Wesley Coffey of the 14th Indiana Infantry, Edward S. Dewey of the 57th Massachusetts Infantry, Sidney M. Ballard of the 39th North Carolina Infantry, William Moody of the 139th Pennsylvania Infantry, Frederick R. Cutler of the 72nd Pennsylvania Infantry, Doctor Bunnell’s makeshift embalming facility, Thomas Nugent of the 27th Indiana Infantry and John Nelson of the 18th Pennsylvania Cavalry. Details of the photographs featured on the front cover, inside front cover, inside back cover and back cover. The author tells stories from his family’s oral traditions about his forefather Peter Karle of the 83rd Pennsylvania Infantry, and then shares his findings of what really happened. This led to the discovery that Karle had suffered a hernia and been hospitalized in Harewood Hospital in Washington, D.C. There he met Surg. Reed Bontecou, well known for photographing his patients. Karle is not exception—he was photographed in the buff. A brief explanation of the role and responsibilities of hospital steward is illustrated with 10 cartes de visite from the author’s collection. A photographic analysis documents three steroview photographs related to the 5th New York Infantry (Duryee’s Zouaves) at Fortress Monroe, Va., in 1861. Two of the images show the surgeon of the regiment, Rufus Gilbert, and his assistant surgeon, B. Ellis Martin, performing an amputation. The third image is a view of the regiment’s staff that includes Gilbert and Martin. Subtitled “Medical Specimens of Three 154th New York Infantry Soldiers Tell a Grim Story,” the author tells the stories behind bone fragments at the U.S. Army Medical Museum, which became today’s National Museum of Health and Medicine. The bones belonged to Cpl. Jerome Averill of Company K, Pvt. Michael Walsh of Company I and Oscar F. Wilber of Company G.
In “The Reverend Doctor Gordon Winslow,” McAfee explains that the theme of the issue prompted him to move away from the usual format to share Winslow’s story. As chaplain of the 5th New York Infantry (Duryee’s Zouaves), Winslow saw much of the war. In 1863 he left the regiment to become Sanitary Inspector of the Army of the Potomac under the auspices if the United States Sanitary Commission. 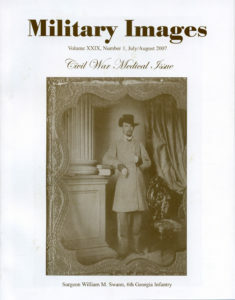 Illustrations include four cartes de visite of Winslow and a carte de visite of his son, Cleveland Winslow, pictured as colonel of the 5th. A carte de visite from the collection of Dr. Paul R. Johnson pictures Lt. Thomas W. Chandler of the 65th New York Infantry. The profile view of the lieutenant shows the prominent scar across his temple, the result of a bullet wound received in battle at Fort Fisher, Va., also known as Jones’s Farm, on March 25, 1865. A carte de visite from the Gordon Dammann collection pictures an unidentified Confederate surgeon. A carte de visite from the Henry Deeks collection pictures the amputated right leg of Pvt. George T. Skilton of the 36th Wisconsin Infantry.